I would REALLY love this coat! 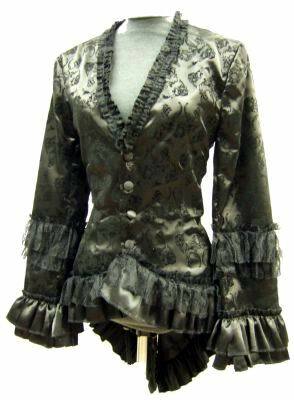 Another interest that fascinates me is the steampunk couture that has been slowly creeping more into mainstream. With the release of Sucker Punch (loved the look of it, was bored and irritated with the story) and Warehouse 13 being a pretty popular show, I seems to find more of it around. So I started collecting ideas for outfits and accessories and started compiling images and websites. At the moment I have a gal with experience in corsetry working on a custom design for me. I’m pretty excited to see how it will turn out in the end, but for now I get to just peruse some of the awesome things I’ve found. This is a duster coat I found online at Etsy. I am saving my pennies for it, because it’s simple, but fantastically elegant and I absolutely love it! The maker seems to be able to customize it to be exactly what I’d like. Since I’m 5’11”, finding dusters that actually DUST is quite a challenge, so I am hoping to hear back from the seamstress about possible alterations. The worst part is that once I CAN order it, the wait will be excruciating. It’s coming from the UK! I also found this fancy coat somewhere (have forgotten the source, will provide if I get it). 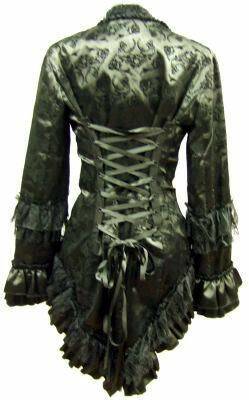 The fabric design, and even the ruffles are interesting features. I am not a great fan of ruffles, but they are subtle enough to add a nice touch without making it look too frilly. Keep an eye out for more steampunk stuff, there will be more! Posted on February 27, 2012, in Steampunk and tagged coats, dusters, steampunk. Bookmark the permalink. 3 Comments. I can see you in BOTH of those! They are so you! Unfortunately I’d look like a loon trying to sport either one. I don’t have the height!